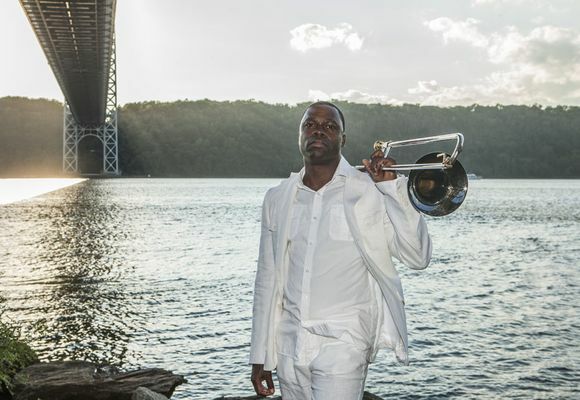 Multi-Grammy nominated trombonist, sea shells player (and sometimes vocalist) is a Philadelphia native (but born in Atlantic City, NJ). He became a professional musician at the age of 16. Was the award winner of the "Al Grey Award for Musical Excellence". It acknowledged Stafford as "the Most Promising Jazz Trombone Talent" of 1993. Graduate from the New School Jazz & Contemporary Music Program (NYC). Of which, he was the first trombonist to actually graduate from the New School Jazz Program. Beside music, Stafford appeared as a model in the December 1992 issue of L'Uomo Vogue (the Italian Vogue magazine for men). This issue also featured jazz greats like Milt Hinton, Clark Terry, Louie Bellson, etc... And, he appeared in a documentary film on the late-great pianist; Dorothy Donegan. Also, he was an actor in a movie entitled "the Day the Ponies Come Back" which was released March of 2001 in France. And, he appeared in a diet Coke television commercial which featured the great Elton John. He has performed at former-US President Bill Clinton's first inaugural. Since then, the trombonist has performed, recorded and toured all over the world with the likes of Illinois Jacquet, McCoy Tyner, Lester Bowie & Brass Fantasy, Abdullah Ibrahim, Charli Persip, Charles Tolliver, Tony Bennett, Roy Hargrove, Cab Calloway Orch., Joss Stone, Orrin Evans, the Mingus Big Band, Lauryn Hill, Frank Foster, Clark Terry, Reggie Workman, Toshiko Akiyoshi, Lionel Hampton Orchestra, Dionne Warwick, Lenny Kravitz, Muhal Richard Abrams, Amy Winehouse, Oliver Lake, Steve Turre & Sanctified Shells, and has been a member of the Duke Ellington Orchestra since 1998 among other groups. And, he is heard as a soloist on Blue Note Records Grammy nominated CD "With Love"-Charles Tolliver Big band. Stafford still performs with the Duke Ellington Orchestra and other groups, but manages to tour the USA, South America, Europe, and Asia with his own groups, Orrin Evans’ Captain Black Big Band, and many other groups. Also, he frequently gives master classes, lectures, concerts as a special guest and gives lessons at universities & high schools in Japan, Russia Europe and around the world. "Continuum" "Line in the Sand" "Honestly Speaking" "Take the A Train" "Sakura"